The ultimate quick look tool for DoPs, Camera & Steady Cam Operators, Focus Pullers, ACs, Remote Head Technicians, VFX Specialists, Post Production Crew, Drone & ScubaCam Operators. Focusing on, but not limited to PL and PV mount lenses. Links to manufacturers' specifications including Depth of Field tables (this feature requires internet connection). Some data can only be found in Lenser exclusively as a result of research done by the developers. When using the app tap the ✚ in the lower right corner of the start page to see a reminder. On the Quick Look page set or pick any of the parameters. 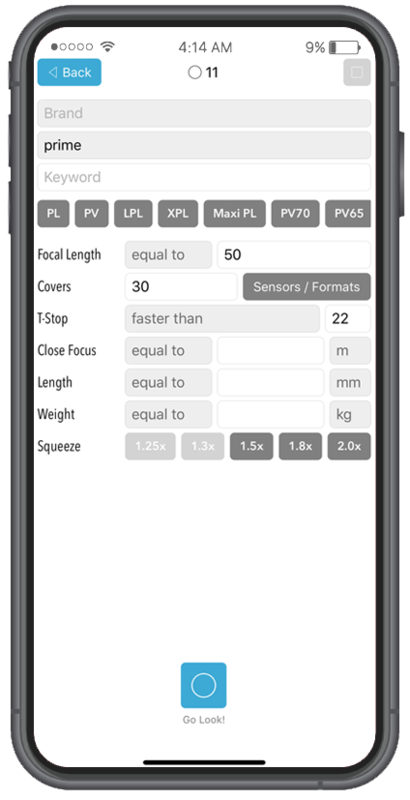 You may use the Sensors/Formats Picker to enter a diameter value in the 'Covers' field. Tap the button in the upper right corner to clear all search fields. On the Quick Look page set the Focal Length picker to 'around' and enter a value. 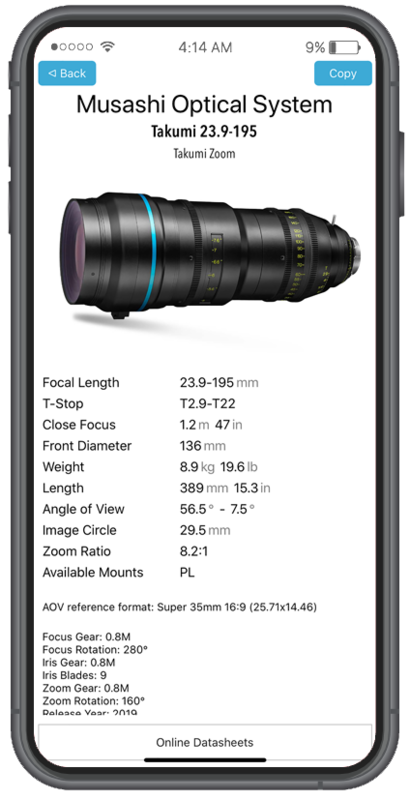 This will give you (where available) 3 focal lengths below and above your search parameter (including). 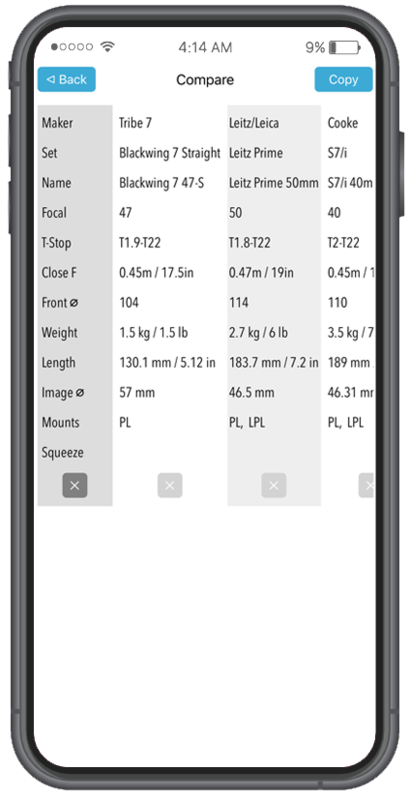 Sensors/Formats Picker can assist you to pick the image diameter of a camera sensor in any available Sensor Mode / Aspect Ratio combination. 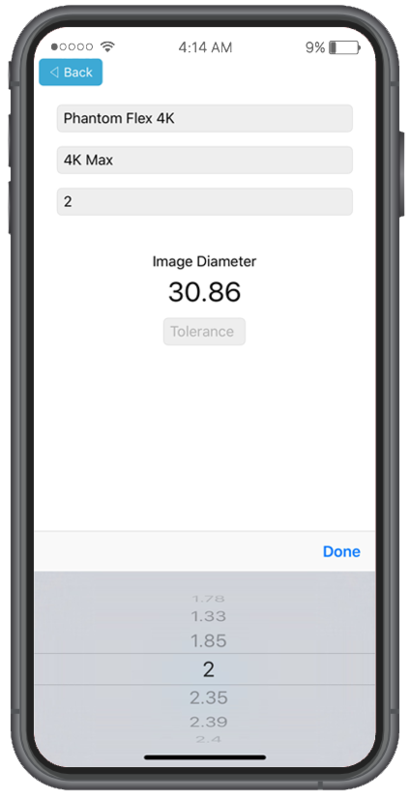 Image diameter will be reduced by Tolerance percentage. Tap 'Go Look!' to start the search. You can store your favorite glasses in a list for easy access. This feature requires iCloud sign-in. The lens is now placed in the favorites list. While on the Main Page tap the ★ button in the lower left corner to access stored favorites. Swipe left and tap 'Remove' to exclude from the list. You can compare lenses with a swipe. Tap 'Copy' where displayed to copy data of an individual lens, lens set, search result or a compare list. While on the Copy Page include/exclude lens data fields to copy. Paste into your favorite messaging or word processing app to share. A simple, but pretty (handy) lens test board. Your changes will be saved when you leave Test Board. JDC X-Tal Express Anamorphic set added. We welcome Meike and the first ambassador of their Mini Cine Prime set - the 25mm MFT lens. Say hello to LENSER Test Board, a pretty (handy) tool to assist you during your tedious lens testing sessions. Tap on the ✚ to access Lens Test Board from the start page. There's always something to refine. Include / exclude fields when copying to share. Many thanks to Keslow Camera for the specs. - M 0.8 lens set added - M mount! Complying with a user request small icons are now added to lens sets to quickly identify Anamorphic [ANA] and Vintage [VNTG] lens sets. 1. Database updated with Canon CN-E Cinema Zoom set. With update 1.3 Lenser reached the '1000 Lenses' milestone! 1. Database updated with Bokkeh Optics lenses. 1. Squashed a resilient bug that crawled out from under the wheel of a dolly. 2. 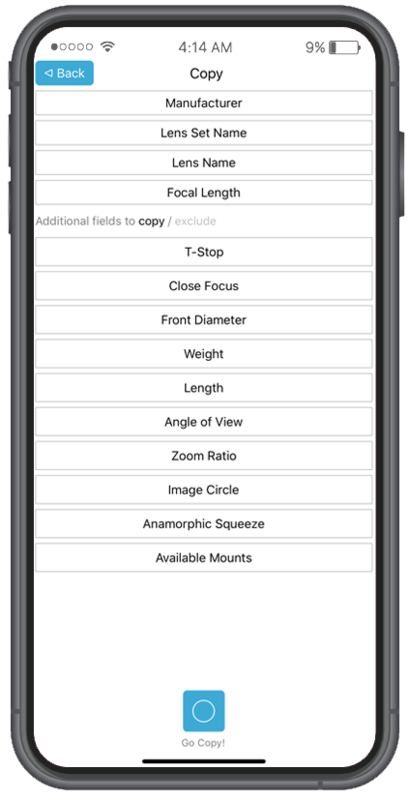 Now you can search for Focal Length while also searching for T-Stop, Close Focus, Weight, Length, AOV, Squeeze at the same time. Eg. : Cooke primes with a Focal Length of 18mm weighing less than 2kg. 3. 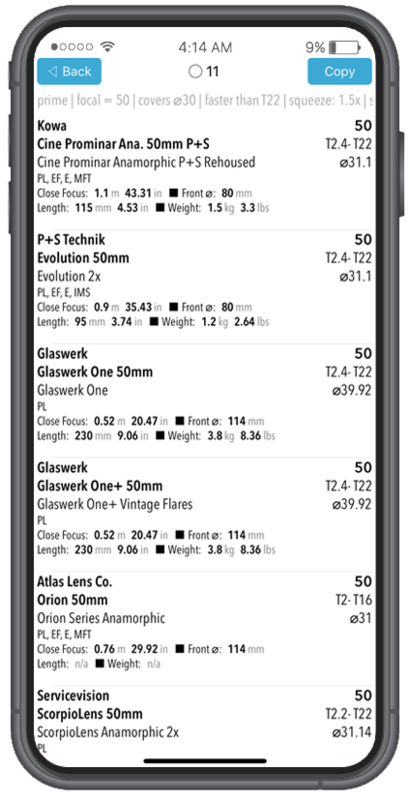 Search for '65+' lenses faster with the updated Type Quick Picker. 4. Exterminated a bug that caused invalid search results to appear in rare cases. 1. Database updated with new lenses and accessories. 2. Fixed a minor issue where entering a smiley for keyword crashed the app. We are sorry for the inconvenience. 2. Search for 'full frame' lenses faster with the updated Type Quick Picker. Information provided by manufacturers is subject to change without notice. Some data is unavailable from manufacturers. This might affect search results. Developers are in no way affiliated with the manufacturers of the products listed in this app. All data are collected from publicly available/legally requested sources. Before you commit to buy or rent it is strongly recommended to refer to the manufacturers' specifications. Links to such data in LENSER is provided as a convenience only. It does not invalidate the necessity of a thorough investigation. If not using HERO GLASSES feature this app does not generate mobile data traffic. This app does not collect personal data or transfer personal data off your device. Online specifications are accessed/downloaded at your explicit request only and data transfer is handled by the default browser of your device. Comments, suggestions or want to contribute? We appreciate your feedback and input. We are constantly improving Lenser and our database.